Yes, we undertake service, repairs and MODS on most (but not all) wah-wah pedals which are based more or less on the original designs. 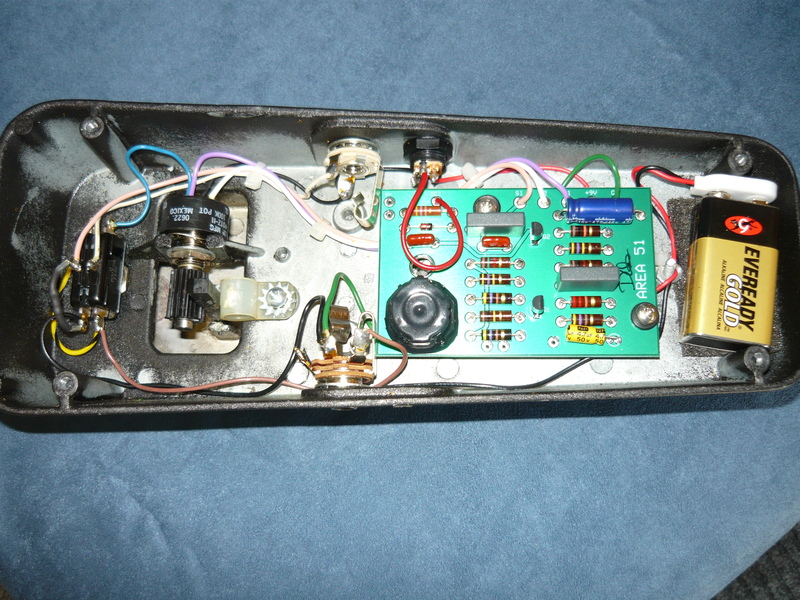 The obvious exceptions would be the Morley pedals which are nothing remotely like the original wah designs, and some of the newer/updated Dunlop wah’s, which employ surface-mount-technology (SMT), making conventional servicing extremely difficult – also there is very little room in such models for additional circuitry, etc. 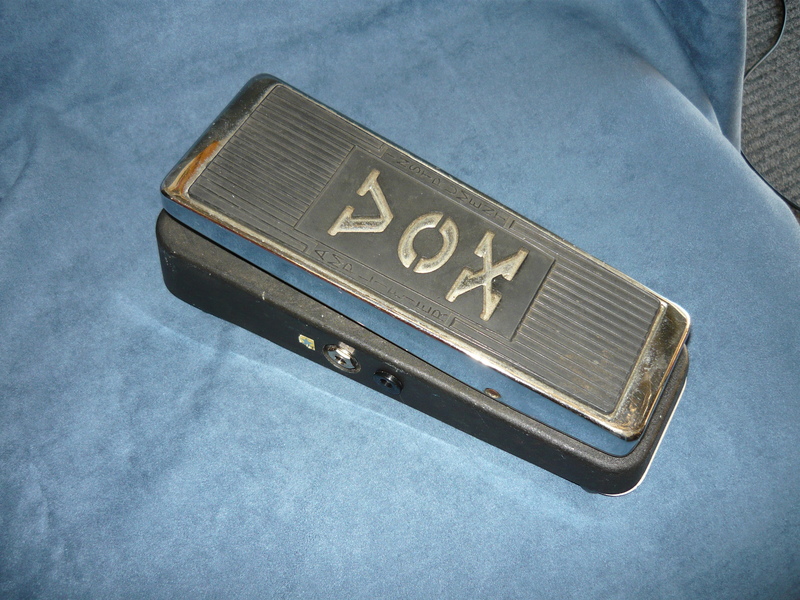 Pictured here is the VOX V847 wah pedal, which already sounds better than average, but the customer wanted to take it to the next level ! I had previously implemented my true-bypass MOD, including a pull-down resistor on the input side to the board, to minimise pops & clicks. Just this one MOD alone made a big difference for the customer. We had already auditioned a wah upgraded with kits from Area 51, and done an A/B comparison with the stock VOX wah, and decided that yes – most wah’s upgraded with an Area 51 kit will definitely have more of that highly desirable vocal quality to their sweep. 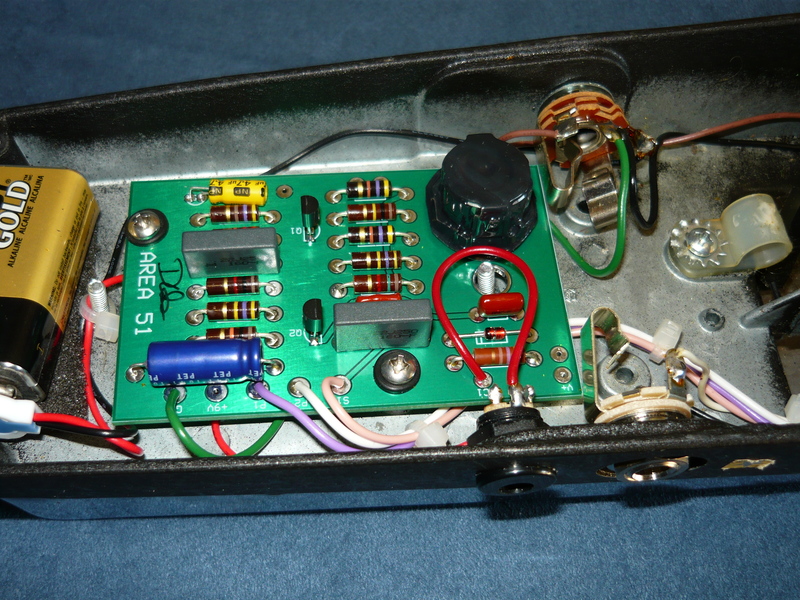 The customer placed an order with Area 51 for their Vintage Italian Wah kit, plus the DC Power Jack kit. He did not include the Buffer kit, intended for applications where the wah directly drives a vintage style fuzz (eg Fuzz Face), this is because the relatively low input impedance of such fuzz pedals prevents the wah circuit from performing correctly. Perhaps this buffer should have been included in the project, as this customer loves fuzz pedals. The DC jack required a neat 1/2″ hole to be created next to the output jack – I have a hydraulic hole punch tool that makes this job easy. The Area 51 board mounts in the same place, but is slightly larger, so this required careful positioning of the IN and OUT jacks to clear the board. Unlike the Vox and Dunlop boards, the Area 51 board requires all hard-wired connections, rather than cheapo push-on connectors. In my opinion this is a big improvement. The DC Power kit also required some additional components to be mounted on the board, for filtering and protection. At the end of the job, the cheapo output jack started playing up, so I threw it in the bin and installed a new Switchcraft jack. While this BLOG is not intended to be an advertisement or endorsement for Area 51 kits – there are other alternatives out there for you to explore – the standard of the Area 51 kit/board/components is very high. The final and most important test is when we hook up a guitar and amp to the wah pedal and confirm that yes ! – this wah does now have a much improved sweep and a very vocal quality. Anyone know how to play Burning of the Midnight Lamp ?? IR. This entry was posted on May 21, 2011 at 10:20 am and is filed under Pedals. You can follow any responses to this entry through the RSS 2.0 feed. You can leave a response, or trackback from your own site. I’ll check this Area 51 thing; I bought a VOX wah from Guitar factory some years ago $90 half price and its quite good considering its chinese but of course it started to sound ‘scratchy’ and i replaced the pot with a Dunlop one which is fine but it needs better travel and vocal quality, i used to have a JEN (italy)but it started ‘scratching’ and i was too young to know to change the pot.